It is a common misconception that most rescue horses are used up, worthless, or are lame horses, but that’s not true. The short answer is that rescues have many different types of horses; Some aren’t great for riding—it’s true—but many can do anything any other horse can do. Rescues have horses with a range of abilities that includes horses that are anywhere from light ride only (low intensity, once or twice weekly), to sound at a performance level. Some horses have health conditions that limit their riding/exercise ability, and they may require a special medication, lifestyle, or veterinary care. What does it mean for a horse to be lame? Lameness, in relation to horses and other equines, is often defined as an abnormal stance or gait caused by either a structural or a functional disorder of the locomotor system. The horse is either unwilling or unable to stand or move normally. Lameness is the most common cause of loss of use in horses. It can be caused by trauma, congenital or acquired disorders, infection, metabolic disorders, or nervous and circulatory system disease. Rescues do take in horses that are neglected or unwanted, but just because a horse is neglected by its previous owner doesn’t make the animal lame. Many may be sound, well-bred animals who ended up in the rescue after their owners fell on hard times. Taking care of a family in this economy can be hard and the same can be said for rescues who care for a family of horses. Rescues typically have many horses who are young, sound and can be trained for anything. Many horses that make their way into a rescue are trained to ride, and then go on to be adopted into loving families that wanted a horse that is ride-able. This entry was posted in General Horse Care, Horse Care by blogeditor. Bookmark the permalink. Is Tiny House Living Illegal in Colorado? Michael Paul as a storied background spanning some 50 years in land, agriculture, horse, equine and ranch property. He began his career in the late 60's as a "land man" for Robo Wash, car wash systems. His job was to find, select and acquire, through lease or purchase, sites suitable for car wash locations throughout the entire State of Colorado. 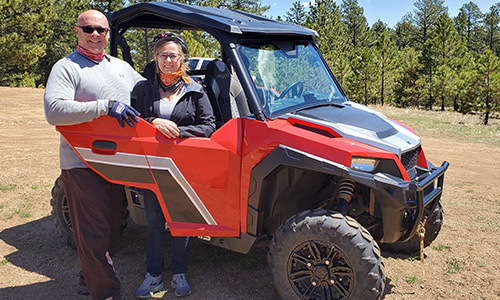 The experience and scope of Colorado from this job is part of the extensive experience that Michael gained from seeing rural, horse, ranch and agricultural property settings. In the 70's and 80's, as an active partner in Writer Development Ltd., Michael was involved in the purchase and development of 27 acres in the Kelmore Professional Park. In addition to a joint venture office building with the Fredrick Ross Company, the partners built and managed the 100,000 square foot ITT-Hamilton Building at 7400 So. Alton Court in Englewood, which later was leased and finally sold to McGraw Hill in 1992. Michael picked up a tremendous amount of development, acquisition and construction know how that would help in knowing the water use, zoning and other critical issues that are so import with knowing rural Horse properties and land. Copyright ©2019 Colorado Horse Properties... All rights reserved.